Coffee is brewing. Regulars are filling the booths and claiming their posts at the counter. The sounds of a bustling kitchen and the smell of baking biscuits are in the air. It’s a standard Tuesday morning at a busy Atlanta diner. Throughout the 70-year-old institution, an un-orchestrated chorus of “may I take your order?” can be heard over the morning’s greetings. Yet for one server, this daily routine is anything but familiar. He’s accustomed to giving his order from the other side of the counter. “I eat for a living and get to write about it,” says Andrew Knowlton, a James Beard Award-winning food and drinks writer, best known as editor and resident “Foodist” blogger at Bon Appétit Magazine. Yet today Knowlton is trading in culinary terms like “foie gras” and “kimchi” to work a 24-hour shift at Atlanta’s Dwarf House, an iconic local diner and the genesis of Chick-fil-A. It’s hour one of 24. For the man who has appeared on the Food Network, traveled to the best restaurants in America and devoured obscene amounts of calories in search of the country’s best dishes, it’s not yet clear whether he knows what’s in store for him today. “I really wanted to work a shift at a diner because I was always in awe of the craziness of it,” Knowlton says. The assignment: Stay awake from 7 a.m.to 7 a.m. and work every shift and nearly every position at the restaurant. “I don’t do bathrooms,” Knowlton adds, smiling. The insomniac-induced concept is part of a new series for Bon Appétit, which will soon embed Knowlton in New York City’s Chinatown and a Las Vegas casino resort restaurant. The mission is to uncover the secrets to surviving the restaurant industry’s overnight shift and what keeps a round-the-clock operation moving, in this case 24-hours a day, six days a week, year-round. That familiarity with the Dwarf House, the first restaurant Chick-fil-A founder Truett Cathy opened back in 1946 and home of the original chicken sandwich, began years ago. While Knowlton is now a New Yorker living in Brooklyn, he grew up in Alpharetta, a suburb about 30 minutes north of Atlanta. “Every time I got a good grade, and after baseball, my mom would take me to Chick-fil-A for the chicken sandwich, waffle fries and the carrot and raisin salad,” he says. That childhood lesson— work hard and get rewarded— continues to resonate for the adult Knowlton, who is now one of the culinary world’s leading voices at one of the country’s premier food publications. But his rise to the top was slow and his path indirect. For the wordsmith who got his first job as a landscaper before heading to college in the Northeast, food was not part of the plan. In fact, Knowlton’s only culinary experience came from making his own meals at home, followed by a cooking stint in a Brooklyn grocery store during college. About the same time, an intern position opened up at Bon Appétit magazine, where Knowlton began working two days a week. “I was always curious. I was always a student of restaurants and chefs. I never assumed that I knew more than anybody else.” That curiosity, paired with discipline and humility, allowed him to move up through the ranks. After 15 years, he was offered the coveted food editor position. With that promotion, other doors opened up — doors leading to regular appearances as a judge on Iron Chef America, The Chopping Block, The Today Show, CBS This Morning and others. But the celebrity status isn’t always easy. Call it thick skin or call it stamina, but Knowlton is now testing the limits of his skill, his patience and his ability to stay awake with the next adventure in his career. Throughout the first shift of his 24-hour assignment, he learns the intricacies of hospitality and adds “my pleasure” to his vocabulary. He works the grill, hand-rolls biscuits and spends an hour under the tutelage of Jackie Banks, woman affectionately called “the pie lady,” and for good reason — she’s been making them for 25 years at the Dwarf House. Once the second shift arrives around 3:00 p.m., Knowlton learns to hand-bread the famous Chick-fil-A chicken sandwich (though despite repeated attempts, is unsuccessful in acquiring the secret recipe). He works the drive-thru, takes orders and serves food in the dining room— with all 14 counter seats and 10 booths nearly packed for the full eight hours. By 10 p.m., and the beginning of the third or “overnight” shift, Knowlton is struggling, and the charge to stay awake all night is daunting. “This is no joke,” he says. Knowlton stays busy, chopping fresh vegetables for salads, preparing the Dwarf House’s infamous “Hot Brown” dish and shadowing the restaurant’s lemon-squeezer, who’s perfected his technique over five years of practice. “His forearms must be as strong as Popeye’s,” Knowlton remarks. That’s because the restaurant hand-squeezes 1,400 lemons a day to prepare its popular and simple lemonade. Knowlton and most of his production team manage to stay awake until morning, but after 24 hours they still haven’t matched the hours the restaurant’s founder logged in his early days. 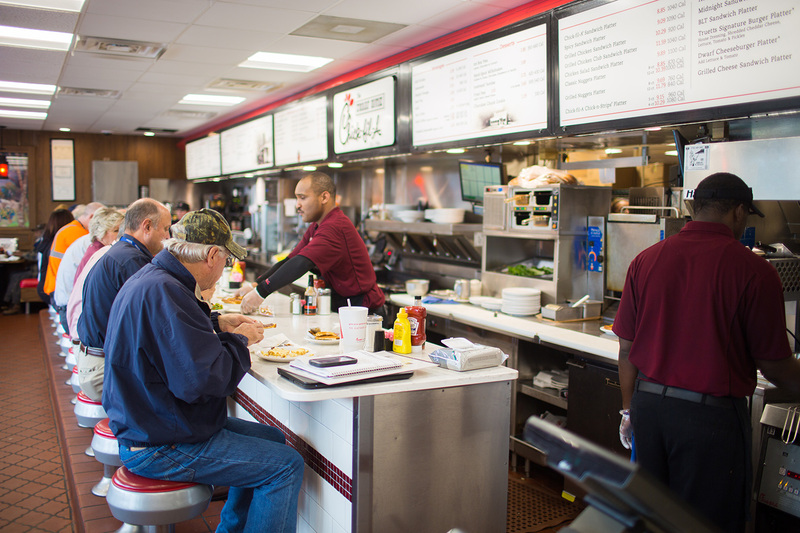 “Truett (Cathy) did some 36-hour shifts,” Knowlton learns from the Dwarf House general manager, Kevin Moss. The result: a “Closed on Sunday” policy, still in effect today at every Chick-fil-A restaurant because Cathy and his staff simply needed a break. Read more about Andrew’s side of the story in his Bon Appetit feature, “What It's Like to Work a 24-Hour Shift at Chick-fil-A”.